NYK has signed a memorandum of understanding with Toyokoh Inc. to examine a joint business development utilizing Toyokoh’s "CoolLaser" technology in the maritime field. NYK aims to reduce the maintenance workload of crew on deck, in addition to dry-dock costs for repairs, and will discuss development of a business to provide a more efficient and environment-friendly maintenance method using Toyokoh’s epoch-making laser technology. Steel used on a ship’s deck is always susceptible to rust due to the harsh outdoor ocean environment that can lead to corrosion arising from severe salinity, temperatures, humidity, and ultraviolet rays, all exacerbated by scratches resulting from wear from cargo loading, etc. During voyages, crew members usually remove rust using power tools and then repaint, but a tremendous amount of repetitive work is required, and the repair does not remain in good condition for long. In addition, rust on the shell plates of the ship is usually remoted at dry dock through sandblasting, a procedure that discharges much dust and waste when an abrasive material such as sand is shot at a high speed onto the shell plates to remove surface contaminants. 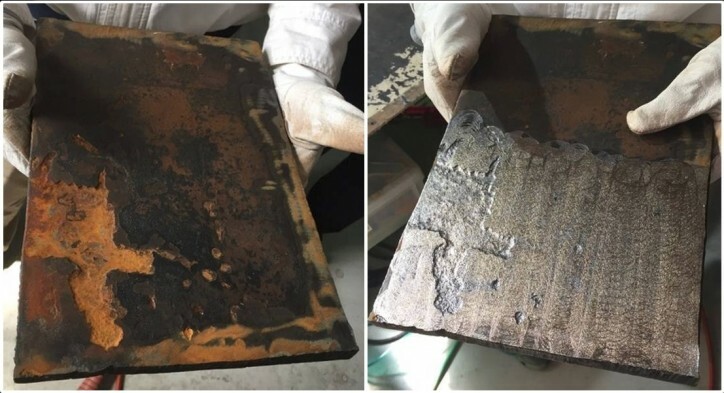 Since 2008, Toyokoh has been making use of its expertise in paint on structures to develop a laser that would remove rust. The CoolLaser uses laser technology to remove rust from steel structures. It can remove rust quickly (even in narrow spaces), eliminate any salinity, and reduce dust and waste. This technology has the potential to be used in a wide range of steel-maintenance situations. CoolLaser not only improves work efficiency but also reduces costs during dry-dock repairs, and lessens burdens placed on the environment. For the use of CoolLaser technology in the maritime field, the two companies will develop a device, system, and measures that suit the maritime industry by studying the impact of lasers on steel material and coating adhesion, in addition to safety measures and improvements. A trial is scheduled to be done on an actual ship while the vessel is in dry dock. In accordance with the new medium-term management plan “Staying Ahead 2022 with Digitalization and Green” that NYK announced in March, the company is taking steps to ensure the sustainable growth of society and the company through safe and efficient maintenance within the maritime industry.